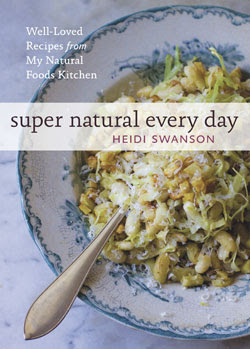 Last night I cooked the best vegetarian dinner I've cooked all year: Heidi Swanson's Miso-Curry Delicata Squash with Tofu and Kale from her new cookbook, Super Natural Every Day. This dish was so simple to prepare, so healthy, and so flavorful and warming; you must put it in your rotation for the holiday season immediately. On those upcoming nights where you're feeling bloated from your cookie swap or that glass of egg nog you should have just turned down, and you're feeling like you just don't have time to cook with the holiday madness swirling around you, give this recipe a try. It is seriously just the thing. It is also terrifically vitamin-packed to keep the cold weather germs at bay. As I set out to cook dinner last night, pulling tofu, kale, and squash out onto the counter, the husband and I exchanged knowing glances that read: "Man, wouldn't ordering pizza just be soooo much better than this hippie feast we're about to put together?" But we were determined to stick to the meal plan, so tofu and kale it was, Saturday night party food cravings be damned. I am so glad we did. This light, energizing dinner sings with flavor from the miso and Thai curry. 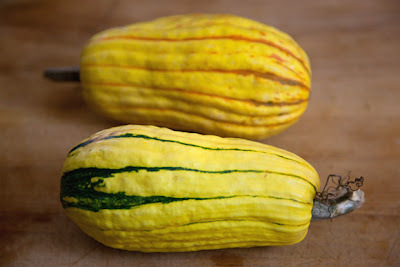 The tofu, squash and potatoes get crispy, crusty and caramelized in the oven, and each bite has an incredible burst of texture and flavor, especially since the delicata squash skin is edible and adds a special chewiness to the dish. We served the dish over rice, but it would also be wonderful with quinoa or just on its own; the squash and the potatoes provide plenty of carbiness. This is a very filling dish, despite its lightness, which is why I think it is perfect for the holiday season. On those nights when you are really starting to feel gross, this dish will hit your nutritional reset button without leaving you feeling diet-y and deprived. You could also pre-whisk the sauce and pre-prep the veggies to really move this into easy weeknight dinner territory. Try it this week! 1) Preheat the oven to 400 degrees with a rack in the middle of the oven. 2) Cut the delicata squash in half lengthwise and use a spoon to clear out all the seeds. Cut into 1/2 inch thick half-moons. 3) In a medium bowl, whisk together olive oil, miso, and curry paste. Combine the tofu, potatoes, and squash in a large bowl with 1/3 cup of the miso-curry paste. Use your hands to toss well, then turn the vegetables onto a rimmed baking sheet, and arrange in a single layer. 5) In the meantime, whisk the lemon juice into the remaining miso-curry paste, then stir in the kale until coated. 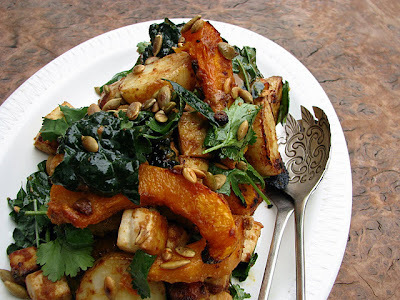 6) Toss the roasted vegetables gently with the kale, pepitas, and cilantro. Serve family style in a large bowl or on a platter. Do you think it would be just as successful without the tofu? Would chicken be an okay substitution? Thank you so much for the recipe, we just absolutely loved it. 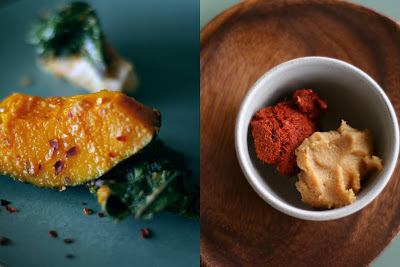 I shared it with my readers too with a link to the recipe on your site (hope you don't mind). Thanks again, it was an instant favorite. (http://genkikitty.wordpress.com) Thanks again.